Presentations begin at 12:30 p.m.
County Presentation Day gives members the chance to communicate an idea or concept to an audience. By going through the process of giving a presentation, members learn how to research a subject, organize ideas in a logical order, and practice public speaking skills which are valuable later in life. There are many different types of presentations, ranging from demonstrations to audio-visual to problem solving. Every member is encouraged to give a presentation each year. A demonstration teaches a skill by the “show how” method. A minimum of 4 posters are used by the member to enhance the teaching process. Visual Aids are encouraged to enhance your demonstration. The posters used should include at least a title, materials, process, and summary posters. An illustrated talk is telling how with the aid of visuals. A minimum of 3 posters are used by the members to illustrate the presentation. You can use charts, posters, photos, computer programs, slides, pictures, models or cut outs. The posters should address the title, information and summary. A science presentation focuses on making sense of the world by constructing knowledge and an engineering presentation focuses on finding suitable solutions to problems by weighing design choices. A minimum of 5 slides or posters should be used in your presentation. An educational display talk is an organized visual presentation of a program or a concept. A display should be designed to convey its message in a limited amount of time. This is a public speaking contest so the speaker should use the time wisely and support the visual presentation. Once the speaker completes the oral presentation, they will have a dialog with the evaluators about the display. Educational Displays may exhibit one of the following display formats: 1) Card Table Display (approximately 30" x 30") - This format will feature a tri-fold poster board that includes a title, the member’s name and 4-H affiliation, and a depiction of the program or concept. 2) Panel Display (48" x 48") - This is a vertical, free standing display. This format requires that the speaker write and deliver his/her own speech. The speaker will inform or educate the audience on a single issue or topic. Advocacy of political or religious views is not appropriate. The purpose of this category is to encourage members to give a speech in which they seek out accurate information, organize it into a useful form and competently present it. The purpose of a persuasive prepared speech is to sway, convince, and influence, not simply to argue. Persuading audience members that disagree with you requires that you think about why they disagree with you, identify areas where these audience members can be moved, and speak to those areas in a way that highlights your shared interests. Visual aids or posters may be used but are not required. Impromptu speaking involves speeches that the speaker has developed themselves at the Presentation Day within a three-minute preparation. One at a time, the speakers will randomly draw a piece of paper with a topic on it. The topics will be developed from the pre-announced categories for the event. From the time that the member is given the topic, he/she will have three minutes to prepare a speech. Speakers may read any published written work that is age appropriate and acceptable for use in a public school classroom. (Examples may include, but are not limited to: children's stories, poetry, essays, speeches, articles, excerpts from novels that stand alone, etc.) Political and religious advocacy is not appropriate. Groups perform acts such as skits and other presentations that focus on health, safety, community pride, citizenship, science, engineering, or technology or other 4-H projects. 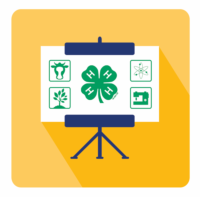 The presentation must include a topic surrounding 4-H. This is a group activity and is not open to individual participants. A member should introduce the activity and its purpose. Notes may not be used. Costumes, props, decorations, and other visual aids are encouraged in this category. No title card is necessary. Presentations are not to exceed 15 minutes in length (not including setup and tear down.). 4-H individual members or groups, projects and clubs, perform a costumed dramatic reading, musical, dance, or other such performing art. Cultural arts presentations may, but are not required to, include audience participation. A member should introduce the activity and its purpose. Notes may not be used. Costumes, props, decorations, and other visual aids are encouraged for this category, but no title card is necessary.